Book Review: Drama Cuts and Drama Cuts Teacher’s Resource Book. Edited by Susan Battye. (Putney., Australia: Phoenix Education, 2010) ISBN 978 1 921586 27 9 ISBN 978 1 921586 30 9 By David O’Donnell: Victoria University of Wellington On a rainy winter’s afternoon in 2006 I attended a performance of Athol Fugard’s Sizwe Bansi is Dead directed by Peter Brook at the Bouffes Du Nord Theatre in Paris. In the romantically shabby-chic auditorium of this crumbling 18th century theatre, two African actors on a stage bare apart from a few simple props and a costume rack held the audience in thrall with this parable on the impossibility of maintaining one’s identity and dignity in the face of a racist political system. Although apartheid had been abolished nearly twenty years beforehand, Fugard’s drama of oppression in a racially segregated South Africa seemed just as moving and relevant as ever, earning a standing ovation from the audience. Sizwe Bansi is Dead is one of thirteen plays featured in Drama Cuts, a new anthology of play extracts suitable for study and performance in secondary schools. Editor Susan Battye has chosen scenes from plays representing a cross-section of dramatic literature from ten Commonwealth countries, many of which deal with the legacy of European colonisation. The anthology is an efficient way for students to access a wide range of historically important plays, and the cultural diversity in the collection reflects the increasingly intercultural demographics of many 21st century schools. An accompanying Teacher’s Resource Book supports the play collection, containing a range of discussion questions on each play, notes on performance and on the playwrights. Clear and impressively detailed synopses of each play enable the teacher to quickly put a scene in context. The Resource Book is a substantial piece of work on its own, and I imagine will be a godsend for busy drama teachers everywhere. The collection in Drama Cuts includes work by two Nobel prize-winners, Nigeria’s Wole Soyinka and Derek Walcott from the Caribbean. Like Sizwe Bansi, the plays all feature strong moral and/or political dilemmas. Read as a collection, this volume highlights the considerable political power and social relevance of great theatre, and illustrates that the canon of dramatic literature can stand alongside the greatest literary achievements (a fact not always acknowledged by English departments in schools and universities). 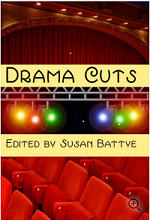 Susan Battye is to be congratulated in raising the standards for drama education with this book. For New Zealand students, it is important to see the two New Zealand works, Bruce Mason’s The Pohutukawa Tree and Lynda Chanwai-Earle’s Ka Shue: Letters Home, in the context of playwriting internationally, and to recognise that New Zealand plays can stand up alongside the best of world drama. The old colonial bogey-man, Britain, is represented by two plays written sixty years apart, J.B. Priestley’s An Inspector Calls and Caryl Churchill’s Top Girls,with Priestley’s critique of the inequities of the British class system reflected through a feminist lens in the scene from Churchill’s play. Battye chooses an extract from the naturalistic second act of Top Girls, and I wondered if the epoch-bending feminist allegory of Act One, with the invention of a dinner party of ‘top girls’ from throughout history, would have been a more stimulating choice. Theatricality is embraced, however, in the extract from Derek Walcott’s Ti-Jean and His Brothers, a Faustian fable set during an 18th century slave rebellion. In this delightful bi-lingual mix of song, dance and allegorical action, Ti-Jean out-wits the Devil, exposing the evils of colonialism and striking a symbolic blow for freedom. Walcott’s work embraces performative variety, illustrating the potential for theatre to unleash the imagination, to fly beyond naturalism with the use of a more metaphoric and entertaining application of physicality. By contrast, Indian playwright Usha Ganguli’s Rudali is very naturalistic but equally delightful in its vivid depiction of poverty among village women. The feminist theme highlighted in this extract punctuates a tale of grim poverty, disease and survival, leavened by compelling humour based in dynamic characters which would be a brilliant challenge to bring to life in a classroom production. The dignity and power of Wole Soyinka’s Death and the King’s Horsemen is represented perfectly in the chosen scene in which the wife of a British colonial officer displays outrageous cultural insensitivity by wearing a sacred garment and mask as a fancy dress costume Many of the extracts draw parallels between the politics of families and wider themes, as in Aroha’s gut-wrenching disappointment in her children in The Pohutukawa Tree, the contrasting experiences of different generations of Chinese women in Ka Shue, and the poignant scene from Leaving Home by Canadian David French. The extract from Ugandan playwright Mercy Mirembe Ntangaare’s The Man His Son and Their Donkey has some parallels with Rudali in its depiction of a wife rebelling against her useless husband. In the husband’s use of the Bible to justify his work-avoidance, it also contains an ironic critique of Christianity. In the extract from Sizwe Banzi, however, the dignity of family is upheld in Sizwe’s letter to his wife, expressing his agonising decision to adopt the identity of a dead man, thus giving up his name and personality, in order to find work under the apartheid passbook system. While this play also contains humour, Sizwe’s realisation that his change of identity will also mean the loss of his family is heart-breaking. Battye has chosen expertly to show how in the theatre, truthful emotion and empathy are among the playwright’s most powerful tools, no matter what theme they are aiming to convey. While the post-colonial emphasis pervades the collection, Malaysian playwright Huzir Salaiman’s Atomic Javaalso refers to latter-day American imperialism. This hilarious satire of nuclear proliferation gains much comedy from a premise that Malaysia develops its own atomic weapons, despite the inconvenience of having no deserts or isolated atolls to test them out on. The heightened parodic style of acting required to perform this play makes an effective contrast with the naturalism of many of the other extracts. Overall, the scenes are perceptively chosen to illustrate a diversity of world cultures, while also containing many thematic echoes between them, and a wide variety of performance possibilities. The collection serves both English and Drama curricula, by the judicious choice of extracts that are equally useful for comparative literary study and for performance. Battye rightly stresses the importance of reading the plays aloud, and encourages teachers to get the plays up on their feet to be performed in the classroom or in public. The balance of performative difficulty in the extracts is about right, with many of them being relatively easy to stage, while some, like Walcott’s play, would create more challenges. The glossary at the back is a welcome aid to comprehension and access to different languages and cultural traditions. The accompanying guide for teachers is undoubtedly an excellent resource, clearly structured to assist the teacher through various exercises and contains a very good thematic overview of each play. There is attention to detail in both teaching and assessment, with excellent notes on how to develop a scene for performance, including templates of response sheets for both actors and audiences. However, there are a few glitches in presentation, including some typographical errors, and I would like to see the date of first production upfront in each script extract, as is the usual custom. In the ‘Notes on the Playwrights’ there is an excellent photograph of Lynda Chanwai-Earle performing Ka Shue, which draws attention to the lack of photographs of the other playwrights and plays. For consistency of style it would have been ideal to include more photographs in this section, as theatre is a visual as well as literary art-form, and visual aids would help the students’ comprehension of the effectiveness of the plays in performance. While the international range of plays in Drama Cuts is impressive, it is unfortunate that in a collection edited in New Zealand and published in Australia, there is no representation of playwriting by indigenous writers of Aboriginal, Māori or Pacific Island descent. The two Australian plays (Summer of the Seventeenth Doll and Cloudstreet) are concerned with white identity and may give the misleading impression that Australia is exempt from the post-colonial issues brought up in the African, Asian and Caribbean plays. The inclusion of one of the many excellent plays by Aboriginal writers would give alternative views of Australian history. Similarly, the lack of representation of Māori playwriting seems odd given the post-colonial focus of the collection, especially as inter-cultural hybrids of Polynesian and European theatre are arguably what make New Zealand theatre unique. However, I realise that in any anthology hard choices need to be made, and the fact that this collection now exists at all is to be celebrated. The post-colonial emphasis gives unity and purpose to the collection, and I imagine the provocative stance of many of the playwrights will create heated class discussions as well as lively performance exercises. Susan Battye has undertaken a mammoth task in assembling these extracts with all of their support material, and has done a great deal towards creating a dynamic curriculum for study that will be inspiring and indispensable for many years to come. Biographical Note: David O’Donnell is a Senior Lecturer in Theatre at Victoria University, Wellington, Aotearoa/ New Zealand. David has directed many premieres of New Zealand plays, most recently Heat by Lynda Chanwai-Earle, Te Karakia by Albert Belz, and Collapsing Creation by Arthur Meek. Other research interests include post-colonial drama, Australian and New Zealand theatre, Māori and Pacific performance, community theatre and Shakespearean performance. He co-edited Performing Aotearoa (2007) a book on contemporary New Zealand theatre and is currently editor of the Playmarket New Zealand Play Series.